This new 2018 research study, funded by the Department of Canadian Heritage, explores the trusted relationship Canadians have with their local newspaper in an increasingly digital world dominated by search engines, social media and ad blocking. Newspapers cover every inch of this country and are on the ground in their communities covering the news that matters to the people that live there. Nine in ten Canadians (88%) read newspapers each week across Canada, on different platforms at different times of day. 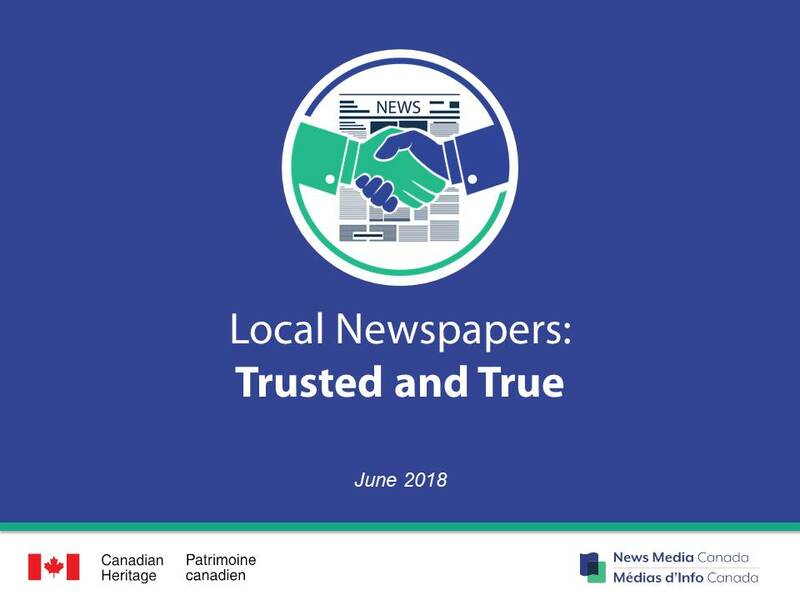 Local newspapers are a trusted source of information in communities across Canada and continue to be the preferred source for local information, with a preference for the printed product. This research examines what drives Canadians to read community newspapers, in both printed and digital platforms. The main reason for reading continues to be something that can be hard to find anywhere else: Local information, in various forms (editorial, news, sports, entertainment, events, crime and obituaries). 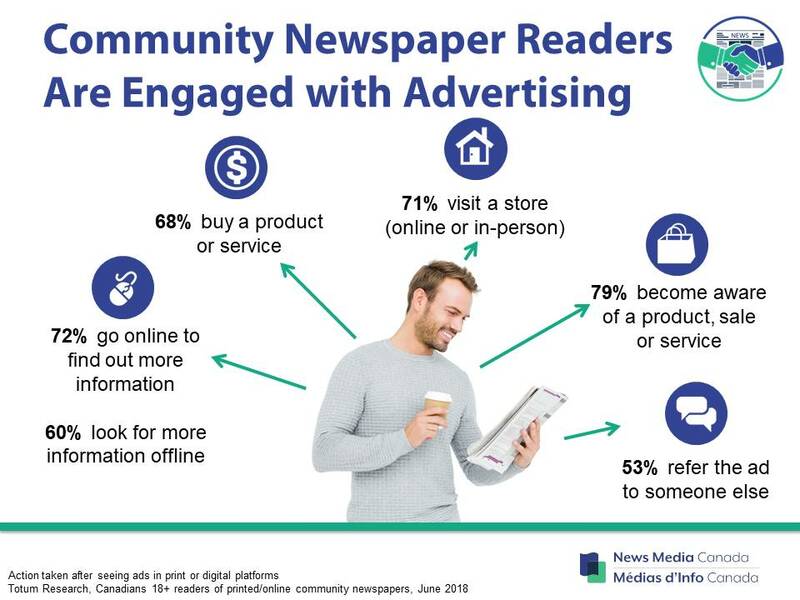 Half of community newspaper readers report the advertising and flyers/inserts as reasons for reading, after local information. Print newspaper ads are effective at driving awareness, store visits and purchases while digital ads prove more popular for research, both online as well as offline. On a daily basis Canadians are surrounded by media, bombarded by thousands of brand messages on an increasing number of traditional and digital platforms. Digital interactions in a single “Internet Minute” are mind boggling. Canadians tell us that they don’t want to see ads in social media; social media is used primarily to communicate with friends and share stories, photos and videos. As a result, more than half of Canadians (53%) respond to digital advertising with ad blockers, primarily on computers and to a lesser degree on tablets and phones. Trust is a key element for consumer engagement. 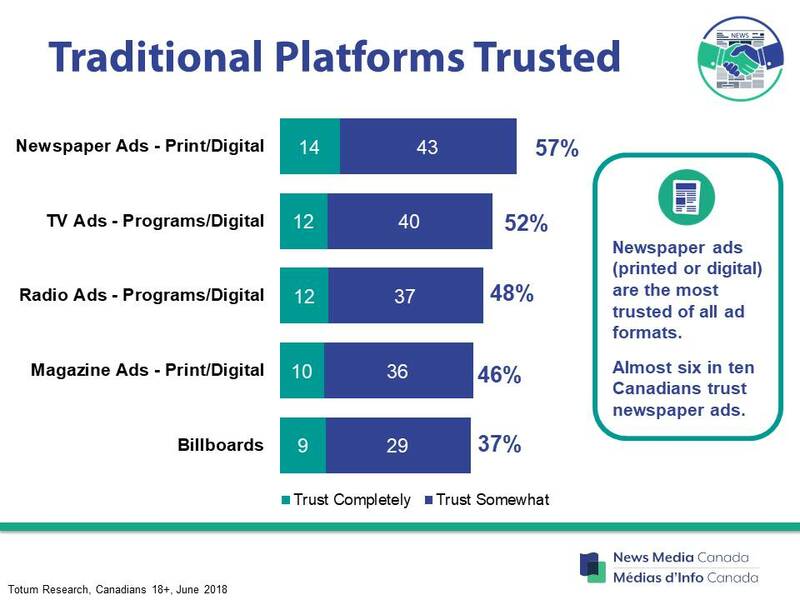 Data on trust in various ad formats reinforces that newspapers top the most trusted list and social media and mobile ads are among the least trusted. It is therefore not surprising that ads in newspapers, printed and digital, are the most read across multiple categories, including automotive, financial products, real estate, telecommunications and travel. Local newspapers continue to provide a trusted source for local news and information to Canadians in communities across our country. Reporters, editors and publishers tirelessly produce local content that is relevant and critical to their communities. In many cases community newspapers are the only source of this local information. This is why newspapers matter. This is why Canadians have greater levels of trust in newspapers and read the advertising within their pages. This is why local newspapers are trusted and true.